Set in Mississippi at the height of the Depression, this is the story of one family's struggle to maintain their integrity, pride, and independence in the face of racism and social injustice. And it is also Cassie's story—Cassie Logan, an independent girl who discovers over the course of an important year why having land of their own is so crucial to the Logan family, even as she learns to draw strength from her own sense of dignity and self-respect. Mildred D. Taylor is the author of nine novels including The Road to Memphis, Let the Circle Be Unbroken, The Land, and Roll of Thunder, Hear My Cry. 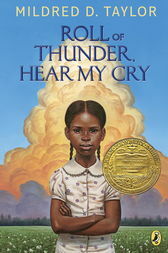 Her books have won numerous awards, among them a Newbery Medal (for Roll of Thunder, Hear My Cry), four Coretta Scott King Awards, and a Boston Globe—Horn Book Award. Her book The Land was awarded the L.A. Times Book Prize and the PEN Award for Children’s Literature. In 2003, Ms. Taylor was named the First Laureate of the NSK Neustadt Prize for Children’s Literature. Mildred Taylor was born in Jackson, Mississippi, and grew up in Toledo, Ohio. After graduating from the University of Toledo, she served in the Peace Corps in Ethiopia for two years and then spent the next year traveling throughout the United States, working and recruiting for the Peace Corps. At the University of Colorado’s School of Journalism, she helped created a Black Studies program and taught in the program for two years. Ms. Taylor has worked as a proofreader-editor and as program coordinator for an international house and a community free school. She now devotes her time to her family, writing, and what she terms “the family ranch” in the foothills of the Rocky Mountains.